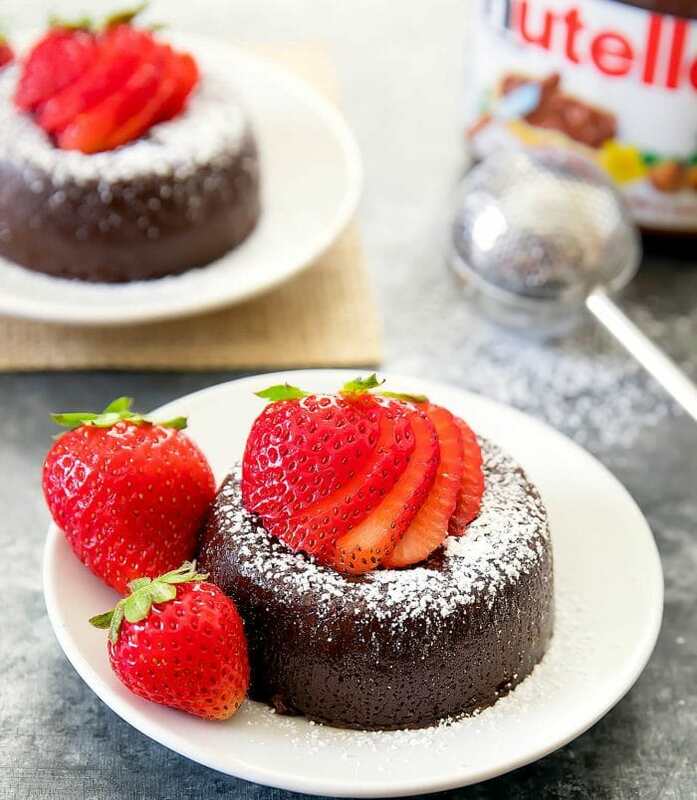 I’ve made Nutella lava cakes before. 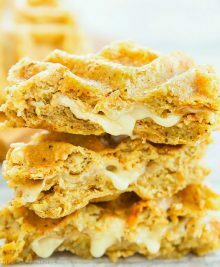 While my traditional oven baked recipe is also just 4 ingredients, it does take more prep. 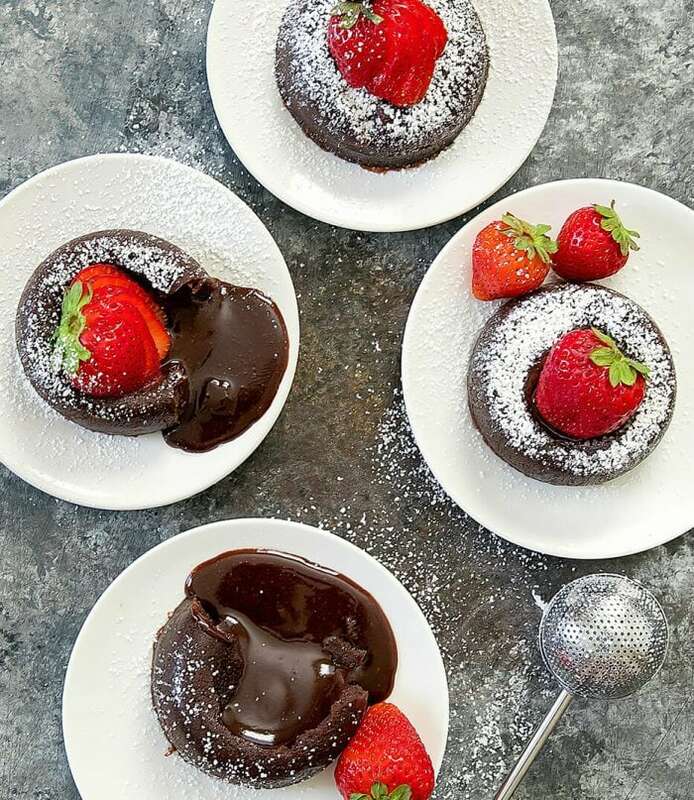 Because these cakes are steamed at high pressure, it eliminates a lot of the prep work that usually goes into lava cakes. And they come out so perfectly. The added moisture helped them slip right out of their containers and each one has a gooey molten lava center. These are especially great for date night or a dinner party. 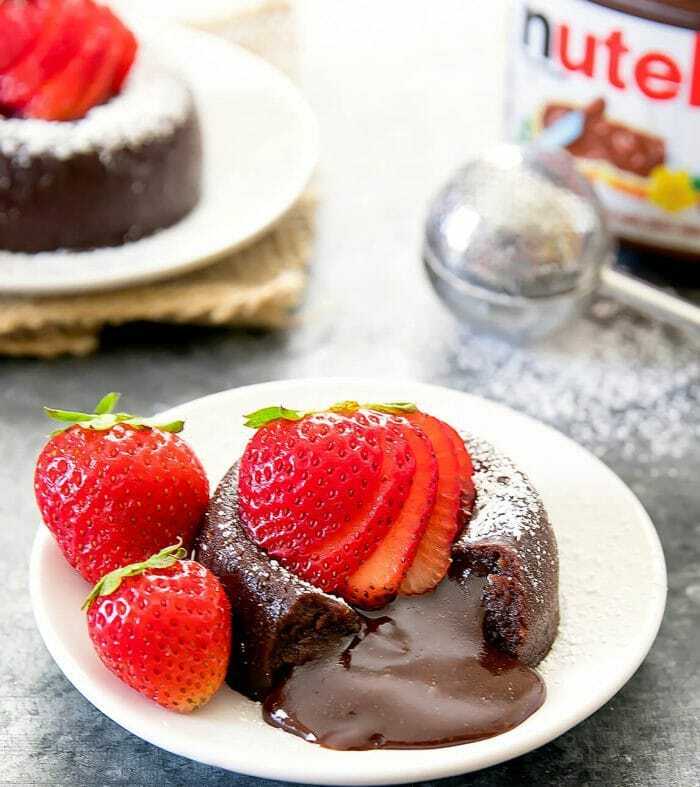 These 4 ingredient molten Nutella lava cakes are cooked in the Instant Pot for an easy and delicious dessert. Add egg and egg yolk to a medium mixing bowl. Mix with a whisk until smooth. Add in sugar and whisk until smooth. Add in Nutella spread and whisk again until smooth. Add in flour and whisk until smooth. Grease two 4 oz porcelain ramekins with cooking oil spray (do not use the baking spray that has flour added). Divide batter evenly between the two ramekins. Place trivet inside the inner pot of your Instant Pot and fill with 1 cup of water. (I use the 6 quart Instant Pot 7-in-1 Multi-Functional Pressure Cooker which requires 1 cup of water to come to pressure. It's my understanding that the larger version and other versions need different amounts of water so please add whatever the amount of water is stated in the instruction manual to allow the pot to properly pressurize). Place ramekins onto trivet. Seal Instant Pot and set to manual, high pressure, 9 minutes. 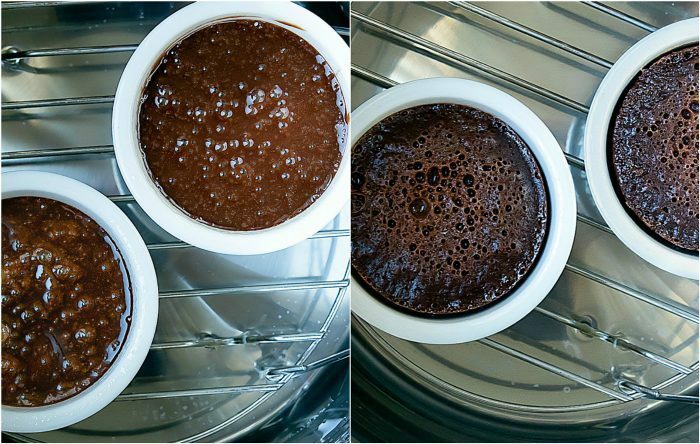 When Instant Pot is done, do a quick release to prevent cakes from overcooking. Use tongs to remove ramekins from Instant Pot. Place each ramekin onto a separate coaster. This will allow you to invert the cake more easily while the ramekin is still hot. Place a small plate on top of each ramekin. Invert the ramekin by lifting the coaster with the ramekin and plate and gripping with both hands (like you're holding a sandwich) and flipping it upside down so the coaster side is now facing up and the plate is on a the bottom. Tap the ramekin a few times too loosen the cake. Cake should fall out inverted onto plate. Repeat with remaining cake. Dust with powdered sugar and serve with fresh fruit. Cakes are best enjoyed while warm. 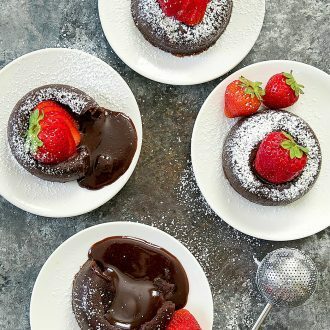 If you don't have 4 oz ramekins*, you can also use 6 oz pyrex bowls*, which have the same bottom width as the 4 oz ramekins so that cooking time remains the same. I do find that the glass bowls don't cook quite as evenly as the ramekins though so I prefer using ramekins. This recipe makes two cakes. If you want to make more, you can cook several batches. You can attempt to cook 4 at a time, using the same amount of water and time. You likely won't be able to fit four onto the trivet, so you'd have to place three on the trivet and balance one on top of the other ramekins. This looks like a fun and easy dessert. I need to experiment more with my Instant Pot. Can you make this will silicone cups? I don’t recommend the silicone cups as I found it harder to pop the cakes out. Just made these cakes and unfortunately they came out very eggy. Do you have any suggestions on adjustments if I want to try to make these again? perhaps they needed to be cooked longer? If you are using smaller molds, the batter will be thicker and they could need a few more minutes. You also want to make sure you add in a full 1/3 cup of Nutella and the sugar. And make sure you eggs are large and not extra large eggs. I hope that helps. 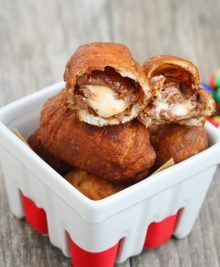 Can I make these without an instant pot? I made this exactly as written, in a 6Q Duo with 4oz ramekins, and I did not get any lava at all – they were well cooked with a slightly soft bite in the center. I chose this particular recipe because I have 4oz ramekins, and many other recipes call for larger. Do you have the newer model of the IP? I haven’t used the newer model but my understanding is that it is more powerful and cooks faster so you may need to reduce the time. How would you need to adjust for 6oz ramekins? I have an 8 qt pot. Thanks! Unfortunately, I have not tested this with larger ramekins or in the 8 quart. 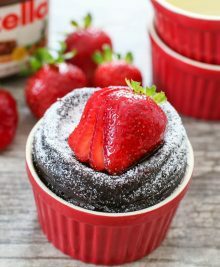 I just made this recipe using 7 oz ramekins in a 6 qt pot and it came out just fine. Can I use this cooking method for matcha green tea flavor? Thanks. A matcha flavored one would need a few different ingredient tweaks. Unfortunately without testing it, I can’t tell you the substitutions that would be needed.